Believe it or not, baby and I are now approaching 36 weeks! There are a whole lot of changes going on during my pregnancy journey so far - both physiologically and psychologically. First trimester (4-12 weeks): some food cravings; mild nausea; no vomiting; feeling tired but not lethargic; super excited! Second trimester (13-27 weeks): some food cravings especially for butter, milk, and pasta; honeymoon period; no major physical discomfort; most people still can't detect that I'm pregnant especially before 24 weeks; love my baby's movements! Third trimester (28-40 weeks): oh-my-god-I-need-more-sleep; I'm-a-peeing-goddess; minor aches here and there; baby moves until I feel like my belly's gonna burst; so funny watching my belly goes lopsided with either a knee or an elbow jutting out once in a while; anxious but excited! 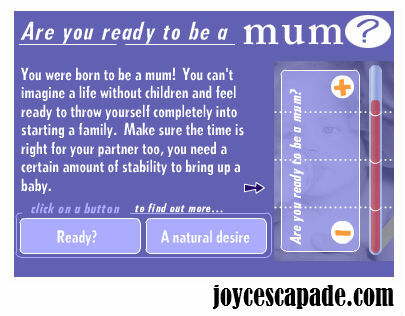 I have also taken an online test just for fun: Are you ready to be a mum? Results say: You were born to be a mum! Also, here's an article that makes me ponder about work-life balance for moms.